Wasn't paid for it - but what does he think? 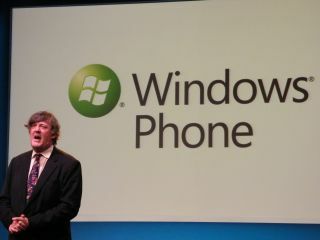 Self-confessed Apple fanboy Stephen Fry has surprised the technology world by turning up to the launch of Windows Phone 7 – Microsoft's new mobile phone operating system. Fry has made no effort to mask his love for Apple in the past, so for him to take the stage at a Windows event is pretty impressive for Microsoft, especially as he was not getting paid for the event. The reason Microsoft got Fry involved was because of a previous quote on Windows Mobile where he compared the designer of Windows Mobile to the designer of a 1960s concrete tower block. "They forgot that even the greyest number cruncher in the corporation is a human being," he said. To be fair to Fry, he was dead right. But now Microsoft has given Fry several Windows Phone 7 handsets to try, he has changed his mind. As well as saying he was not getting paid for appearing he said he would only be able to keep one of the handsets. "Microsoft now get it. They get that people...are human beings first," he said. Why did he like other handsets instead? "I felt pleasure through [using] them," said Fry. "Our lives flow through and out of [these devices]." Speaking about Ballmer's speech where he had said that Windows Phone 7 was fun, Fry joked: "what joy there is in heaven when a sinner repents! My first feeling [on Windows Phone 7] was that it was just fun to play with." Fry also made no qualms about berating Microsoft for its past endeavours including Windows Mobile but most notable was his quote on Vista, saying : "Windows 7 is better than Vista. Mind you, the sh*t on my shoe is better than Vista."